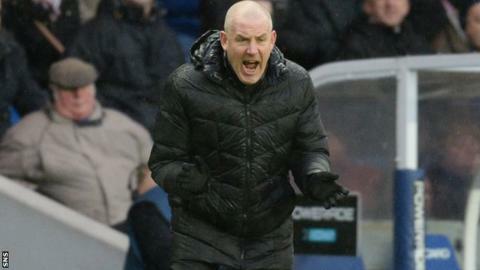 Mark Warburton believes his Rangers side are only going to get better after a dominant Scottish Cup fourth round win over Cowdenbeath. Martyn Waghorn netted a hat-trick as Rangers eased to a 5-1 victory at Ibrox, and their manager believes his young squad are on the right track. "I'm looking at Martyn Waghorn at 25 years of age as being one of the senior pros," Warburton told BBC Scotland. "So it's a very young squad but we're getting better and we're learning." Despite the convincing nature of the victory, Warburton still thinks there are plenty of improvements to be made by his side. "It was a tough challenge today. You're not sure what to expect and the cup north and south of the border brings the big upsets so we had to prepare well, deliver a good performance and we did that," the former Brentford manager said. "We were in total control possession-wise. We must take our chances, be more clinical in the final third. "I thought Barrie McKay today was outstanding. Just turned 21 years of age so lots more to come from him. "We had players all over the park looking to score and get into attacking positions. The more we can do that, the better shape we'll be in." Cowdenbeath manager Colin Nish said the score was a fair reflection of the match. "I don't think we can complain about the scoreline," Nish said. "Rangers had enough chances to score more. We knew they would create chances, we knew it probably depended on how many they took, but I thought my boys were great. They worked hard, they done exactly what we wanted. "We're playing against a good side, a better side than we'll play every week. We wanted the boys to come and learn something today, watching Rangers passing and moving and I'm sure they'll take that on."